L 7 1/2″ (19 cm). Song is series of quavering whistles: two notes on one pitch followed by two more on another pitch. Description: Sexes similar. 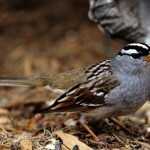 Breeding adult has black crown, face, and bib; pink bill; grayish cheeks. Upperparts are buffy brown with black streaking; white belly with dark streaking on sides. Winter adult has blackish crown; buffy cheeks; throat may be all black, show white flecks, or have a white band; flanks are buffy. Immature is similar to winter adult but has less black. 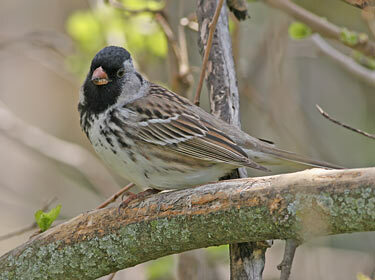 Habitat: Migrants and wintering birds prefer areas with shrubs, low trees, and tall weedy plants. Found in rural, residential, and urban areas, often near streamside woodland edges. 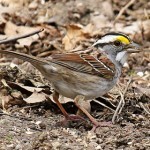 Where in Nebraska: Abundant spring and fall migrant in eastern Nebraska, and common farther west. Regular winter visitor in southern parts of the state. 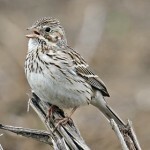 Joins mixed flocks of other sparrows during the winter. The largest sparrow in the United States. Found in Nebraska during winter and migration, it is the only bird that breeds in Canada and nowhere else in the world.